Happy Monday! Today I’m sharing about how I’m thinking about spring fashion in the winter. I know we’re in the midst of winter but I can’t help but think of spring and the fashion that comes with it. I fortunately live in LA so it doesn’t get too cold except this past week it has been raining and very gloomy and grey out so all the layers are needed. Before the rain, I did shoot a fairly spring colored outfit. Even though I said this here was my first outfit shoot of the year, I lied as this was taken a week before it and a week into 2019. 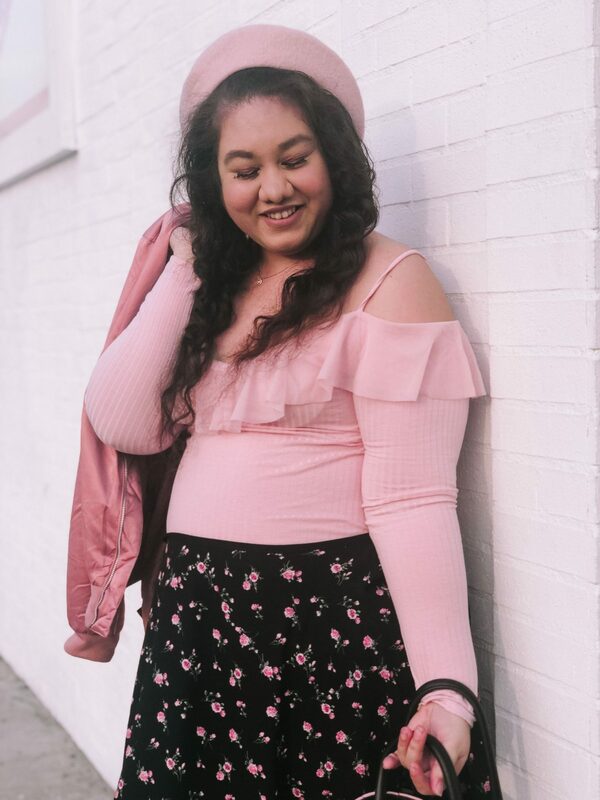 I was putting it off to publish this as it was too pink and spring like and I wanted to wait until maybe February but I still loved this outfit and had to share it. I mean January is almost done so might as well. 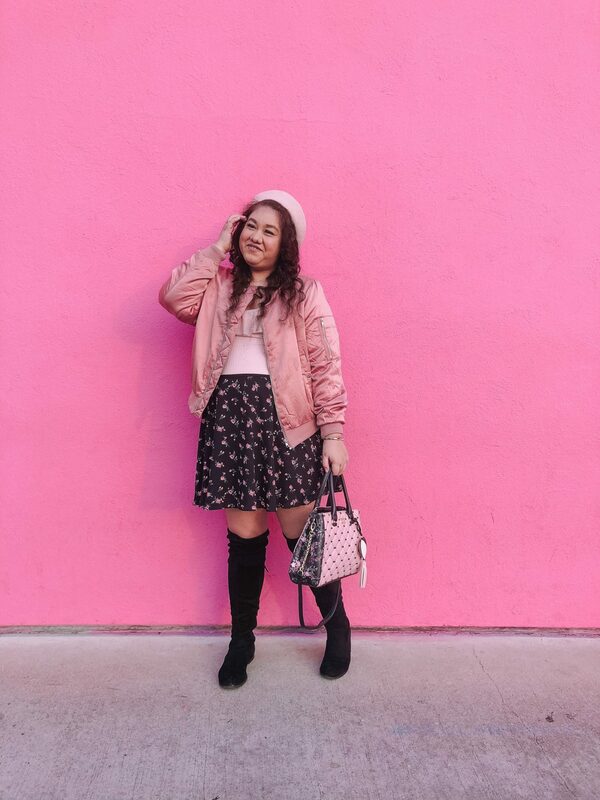 So here is a very spring like outfit as I’m thinking about spring fashion in the winter! 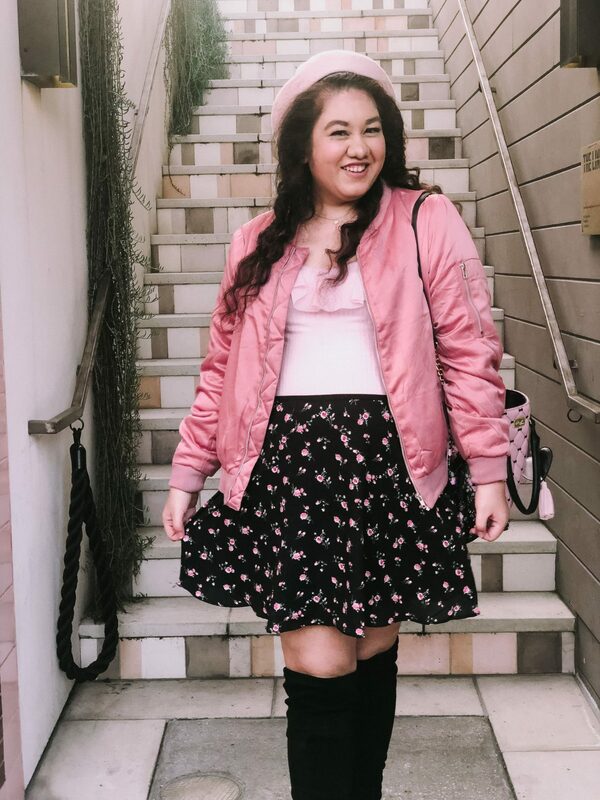 I’m sharing a look that will transition you into the spring season. It was a little cold when I shot this outfit in the afternoon here in LA. I was only outfit a few hours and then went home so it was fine. I was thinking it was perfect for spring with the colors and the patterns. I mean it is quite chilly to wear this now in most of the US but maybe someone is needing inspo for planning vacations very soon! I know it would be such a cute look for somewhere warm. This top was such a sale when I bought it. I think I paid $3 for it. Yes, seriously! It was such a bargain and I didn’t just buy it for the price but it’s so cute too. 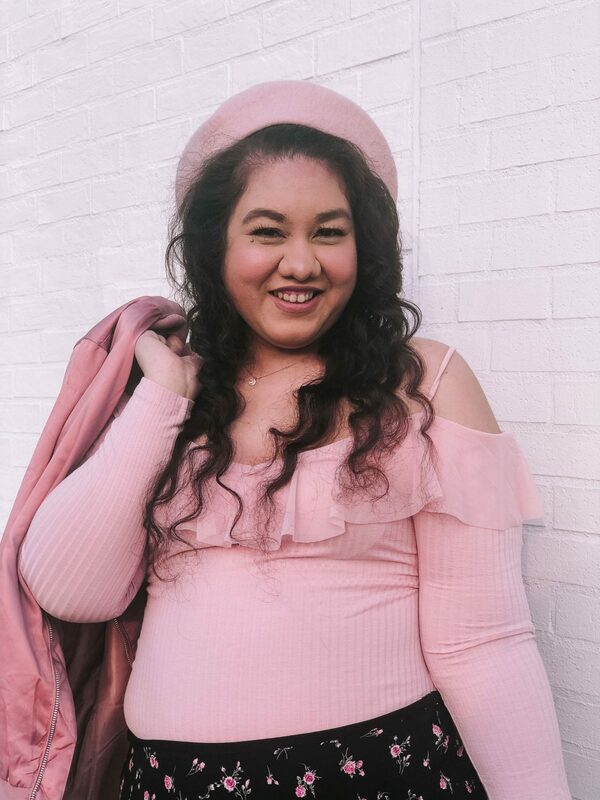 It has this ruffle tulle trim and cut out shoulders which makes it a summer top but it has long sleeves too making it a transition top for winter to spring. The straps are adjustable so don’t just wear it like I did so try to fix them so it fits better. I honestly think this is the girliest top and too cute. 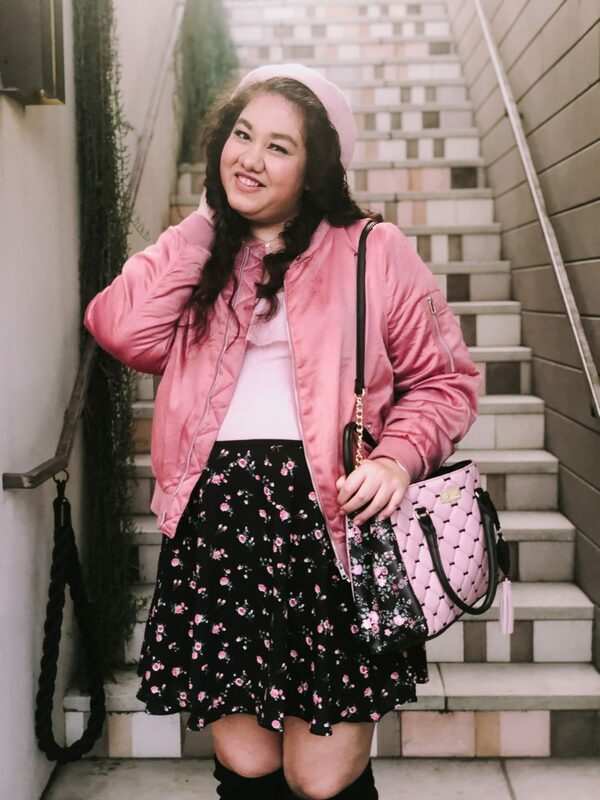 I paired it with a pink satin bomber on the top to add another layer and keep me from the cold. The skirt is so pretty and florals for spring is so new for the season, am I right? I love this exact floral print and I actually have shorts in the exact same print. It’s is a bit too big on me as I think I’m a small size now but it’s the perfect length. Both the top and skirt are 2x oh and the bomber jacket is too. The bag I got in July and honestly haven’t used it as much as I thought. Since it has multiple prints on the bag it is quite difficult to pair with some of my outfits as I don’t like to clash too many prints. This outfit however matched perfectly. The sides of the bag have the exact same floral print which is the cutest and as soon as I saw the skirt I knew it would look great with this bag. Plus all the colors go together. I paired this exact look with otk boots to make it a bit more winter appropriate but I can definitely change it up for sandals in the spring when it warms up. Another footwear option could be some booties to dress it down a bit and transition it to fall. What I’m saying is you can change up this outfit for what season with just the change of layers or footwear. The accessories with this outfit I did go with all matching again and even with the jewelry. Since it is more a winter look I went with a beret instead of a bow. 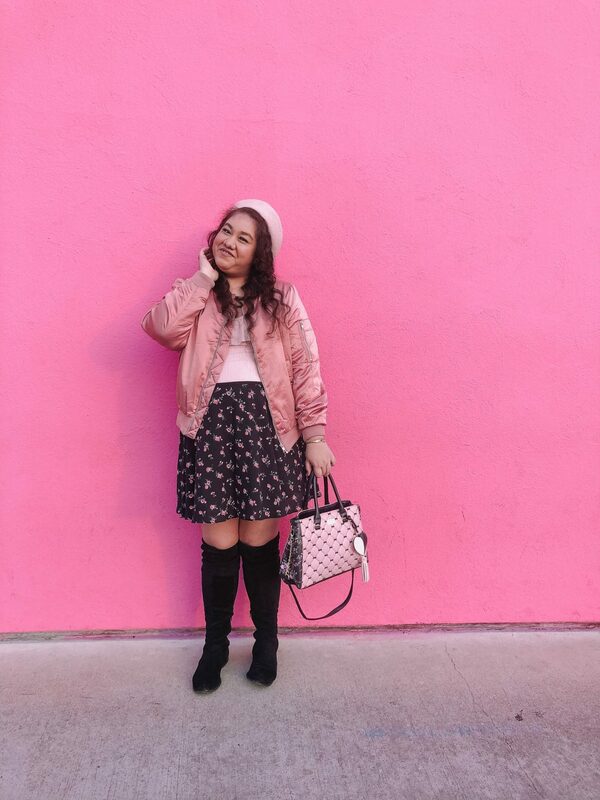 I loved this blush pink and it is the exact same shade as the top but not the bomber jacket so it gives it a few shades of pink in there. My jewelry I have added more pieces to my collection so I’ve been wearing them. I knew this top needed a necklace and sine there was so many prints I went with a simple dainty one. I’ve also been wearing my bow ring that I got for Christmas and a gold bangle which is peaking out from the jacket. It’s there even though I have long sleeves. I still wanted to wear it as a little surprise detail. And that’s how I’m thinking about spring fashion in the winter and the outfit details to bring out the seasons. Now that’s how I’m thinking about spring fashion in the winter! I love this outfit and I’m so excited to wear this again when it warms up and style it a bit different. I might do an updated version if you would like to see a spring summer version of this. 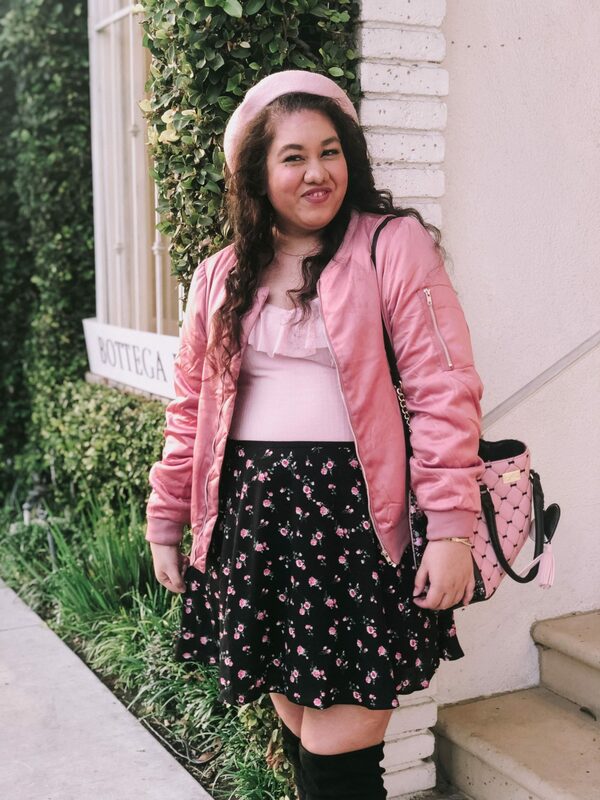 So this is a little sneak peak of my spring looks and I’m so excited that I am already planning my Valentine’s Day outfit ideas and will shoot those soon to have it up for you. I’m so excited to start dressing with colors again and not be so grey and gloomy with all the neutrals I’ve been wearing. So that is what I’m thinking about spring fashion in the winter and let me know how you’ve been dressing with this weather. Thanks Alyssa I do love my pink! I am so with you on this! It is -30 with the wind today in upstate ny!! And girl I am loving this spring outfit. And I really adore your betsey johnson bag- i have the small white quilted one with hearts and it’s literally my favorite purse- perfect size and everything. Thanks Shannon! I could not handle the cold when I was in New York and it was 20 so I can’t imagine that. Hope you get spring weather soon! Also their bags are so amazing! Thanks and glad you think so! Love this pretty color. I’m already thinking about spring fashion too! Thanks Carolyn! It is such a great color! Girl! I am so hungry for spring!!! 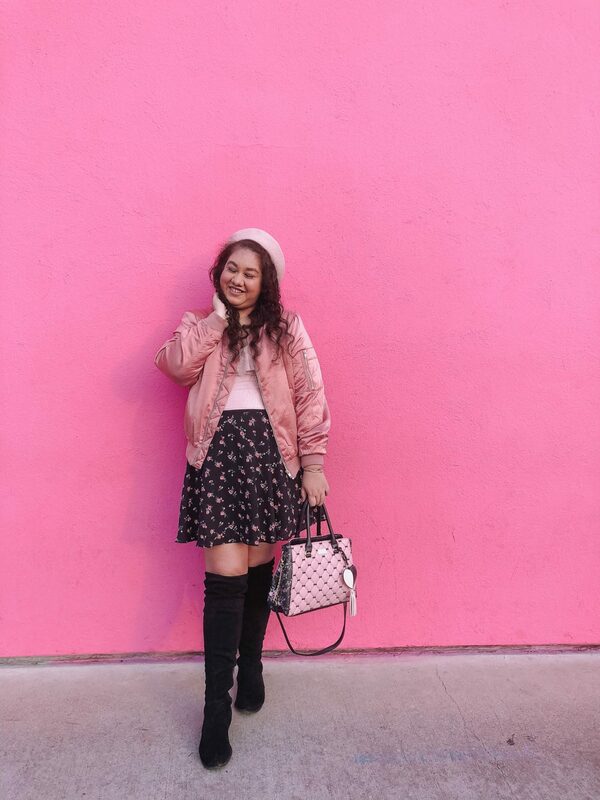 Love the pink jacket! So cute!!! Thanks Lauren! Glad you love the jacket and hope spring comes soon! I loving the transition look. It has the fun colors of spring mixed with layering pieces to keep you warm. Thanks and glad you think so as it was my aim! 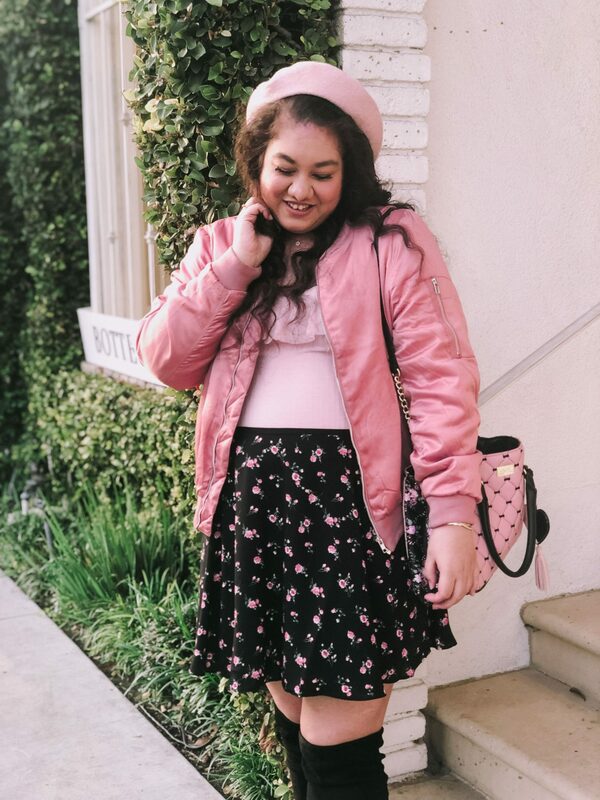 That jacket is super adorable! 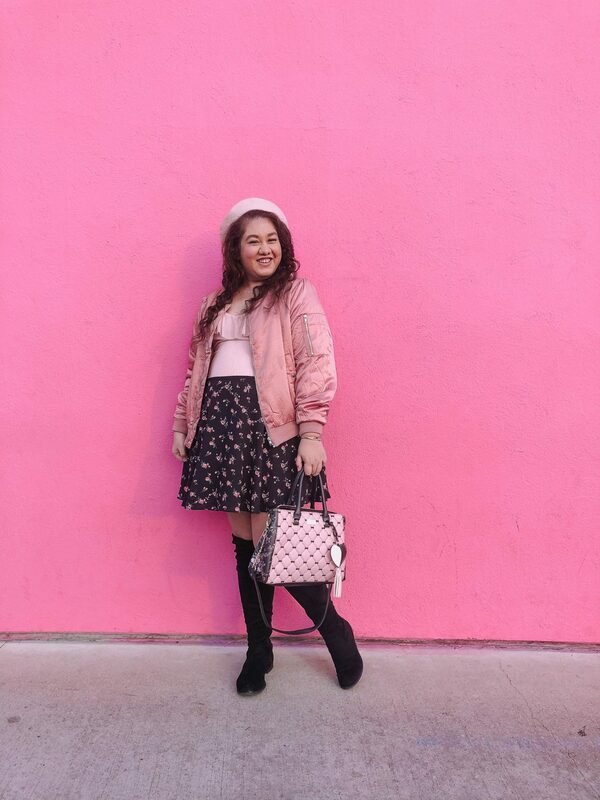 I love the soft pinks – never goes out of style! Thanks Mandy and I agree I love pinks any time!